Chennai-based Freshdesk Technologies Pvt Ltd has launched its own app marketplace for developers and clients, the company said in a press statement. The marketplace allows customers to discover and install apps and helps maximise the capabilities of their helpdesk. Developers can earn revenue through integrations and extensions. It enables flow of information between Freshdesk and various third party applications, the press note added. The marketplace currently has a portfolio of over 100 apps including Teamviewer, Slack, Salesforce, Jira, Skype and G-Suite covering key categories from collaboration to telephony. Freshdesk competes with homegrown Zoho and US-based Salesforce, which already have their own app marketplaces. In November last year, the company raised $55 million (Rs 366 crore) in a Series F funding round led by Sequoia Capital India and existing investor Accel Partners. Freshdesk said it will use the money to launch new products and global expansion. In January this year, Freshdesk Inc. had acquired software-as-a-service (SaaS) startup Pipemonk for an undisclosed amount, which was the firm's seventh acquisition in the last 16 months. It was part of an overall strategy to create an ecosystem of interlinked Freshdesk and third-party products for businesses. 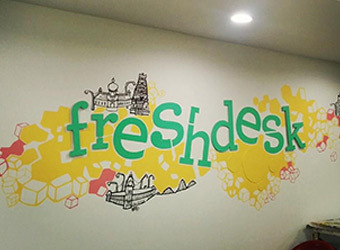 Freshdesk was founded in 2010 by former Zoho employees Girish Mathrubootham and Shan Krishnasamy. The SaaS-based startup provides customer support solutions. Its flagship product, Freshdesk, allows organisations to support customers through email, phone, websites, mobile apps, forums and social media. Its clients include 3M, Honda, Bridgestone, Hugo Boss, University of Pennsylvania, Toshiba and Cisco.